What's already here in DMA 2019, and what's coming soon? OMG Co-founder Mike Long is live in the chat till Midnight Pacific! You can locate the chat box in the bottom right hand corner of this page, the green box! Mike is here until Midnight Pacific, when OMG closes for the season. ...whether you are new and looking for your first reliable results, or have an existing business that you want to scale for long term stability and wealth. Make sure you've seen our "Elephant in the Room" webinar that is meant to go along with this registration page. Click here for that replay! Be sure to check out our shocking #PoweredByOMG Instagram channel by clicking here! Then there is the astonishing OMG Reports Facebook Group - click here! Plus, if you want to keep checking us out, there is this amazing earnings reports page! Then, if you really want to be thorough, make sure to also check out our fantastic testimonials page! How is it possible that one underground program can be responsible for so many hundreds of success stories? The awesome strength of OMG's DMA (Digital Marketing Agent) program lies in three places: WHAT we train you to be able to do, WHO is directly training and coaching you, and HOW that training and coaching is done. WHAT money-getting process we train you in: One of our co-founders calls our primary money-getting recipe the "Perfect Process." The opportunity began with the rise of the internet for commerce, about 10-15 years ago, and a new technology that went with it: organic search engines based on algorithms, especially Google. Just hard enough and scary enough to keep most people away, the skill of doing SEO, as an OMG member, is so very realistic to master, and so very valuable once you do. There are multiple ways to monetize this new ability you'll have to get targeted visitors coming to you (or coming to your clients' websites). Ecommerce, affiliate marketing, and various forms of consulting and JV'ing are the primary methods, and we have co-founders (who do the training and coaching directly) specialized in each of them. Creating and monetizing free traffic OMG-style - we've honed the perfect process for ourselves and for our membership community. We also have excellent training on topics connected and related to organic search traffic, such as how to add to your web traffic with inexpensive google and YouTube paid ads, plus Facebook ad training. (Including over-the-shoulder training of setting up a Facebook ad campaign for a real client.) Plus, sales funnel training and demonstration. 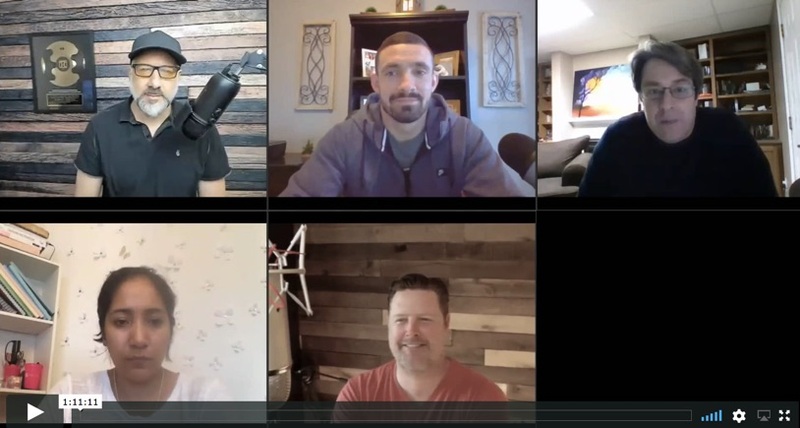 WHO does the training: including myself, OMG's DMA 2019 includes 6 co-founders, plus special guest bonus training, such as Jake Tanner, an OMG'er who placed highly in the INC Magazine 500 with his fast-growing digital marketing agency. You don't interact with any hired staff or hired coaches - you learn from and ask questions to and get on webinars directly with us. The co-founder/coaches are ultra-successful (well into 7 figures of online profits each) in a current and ongoing way, OUTSIDE of OMG with their own organic web traffic-based agencies, joint ventures, ecommerce websites, and affiliate marketing websites. Our training is based on their massive ongoing research, plus their reliably duplicated current practices, strategies, methods, and tech that they are using right now in today's online marketing world. Our training is NOT based on schmoozing with other "gurus," interviewing other gurus, regurgitating other gurus' blog posts, etc. While we obviously talk to other successful online marketers and discuss ideas at times, and sometimes (rarely) bring on guests, our training is based on our own current, real-life, and original research, experience, testing, etc. HOW we train, demonstrate, navigate: We use an ideal blend of recorded step-by-step training, combined with multiple webinars each week with ongoing training, coaching, Q&A, new reveals of our successful strategies and tech. We've also pioneered a method we call "over-the-shoulder" training, where we are sometimes able to show you every minute spent on a website (and on an overall internet money-getting project) including the search engine optimization activities performed for it, so that you see exactly what is done and that it is real, rather than just being taught theoretical lessons or sanitized or second-hand reports of what works or has worked. And, no matter how good our recipe and how clear our training, in real life there are plenty of twists, turns, unexpected issues, and other questions. There is no such thing as a recipe that everybody can just follow without having what I call navigation added into the mix. Also, the market can change, new technologies and services are constantly being created (or going away), and search engines like Google can make changes in their algorithms. OMG training is constantly kept new and fresh, and the co-founder/coaches are learning by doing and experimenting, and with you each week with fresh training and Q&A to supplement the existing step-by-step training. To summarize the HOW: step-by-step recipes, plus consistent ongoing navigation and Q&A, plus fresh and new updates, discoveries, reveals, over-the-shoulder projects demonstrated, etc. Furthermore, we have an active private secret members-only Facebook group, a wonderful community where we support each other and where the coaches can answer questions. Time Frame: DMA (Digital Marketing Agent) takes place in a members area with a LOT of existing training, all fresh from 2018, plus selected training from 2017 that is still current. Plus, you receive your ongoing webinar schedule page which gives you access to multiple live webinars each week, directly with our co-founders. For this season, these live webinars will extend through December 2019! After that, we have a program that allows you to continue with OMG's ongoing training, updates, and live webinars at a large discount (around 60% off for returning members). Price: We are priced as an extremely affordable top-tier coaching program. Our co-founder/coaches have commanded $10,000 for a few-day mastermind, or even for one day of walking somebody through their secrets and practices. However, the great news is that the actual price of DMA (Digital Marketing Agent) 2019 is approximately $5000... broken up into our very popular and unique 12-payment plan of $419/month! Yes - DMA 2019 is a premium and proven program that is also ultra-affordable! Is there a catch? A couple: we ask that you have the attitude of an entrepreneur, not an employee (or employer with us as your employees). We also do our coaching via webinars and our private members Facebook group, rather than via the phone or Skype. We do give you one-on-one attention in many of the webinars, making sure to address literally all questions that are asked, but we just want members to be aware that they aren't signing on for phone coaching. We ask that you be pleasant and respectful to our members and to us. If any concern arises, please talk to us privately via Facebook message or especially via omg@omgmachines.com. We've been doing this for several years and likely have all of our "bugs" worked out, but if something arises, let us know. Refund Policy: We have a no-refund policy. For five years running, we've found that policy creates the highest level of seriousness and trust from ourselves and from our members. We know and greatly respect that members are serious, and we stay relentless, because we can't tell ourselves, "well, they had their chance to refund and didn't." What about canceling the payment plan? We ask that you treat us honestly, in return for us treating you honestly. Our payment plan isn't a month-by-month subscription. To benefit you the most, and not hold you back by dripping out information, you receive a large amount of training (and webinar replays as well, dating back to January 2018+) immediately upon joining. Our extended payment plan, which you are welcome to choose, actually extends past the live webinar period (live webinar access for DMA 2019 extends through December 2019). By then, we find that our members have seen that we have done all that we claimed, and more, and nearly all finish their payment plan. All of that said, we understand that you can run into a financial emergency, and if you request to cancel or postpone payment, we will honor that. P.S You can chat with Mike Long with your questions about DMA 2019 using the green windown in the bottom right, or you can reach Mike here on Facebook. Used exclusively for letting you know about when our program opens or closes, and for when we have open webinars, and for live events. Copyright 2019 - omgmachines.com Terms and Conditions can be read by clicking here.